My android and my surface from time to time disconnect from WIFI. Android keeps saying no network found. I need to disconnect and re connect again every time. Please help. For a $300 router this shouldn’t happen at all. 2,4 or 5 Ghz ? How long disconnect ? Which 5Ghz channel is set? No microwave oven around in operation ? I have tried this solution today… hopefully it addresses the issue with 5 Ghz wifi disconnect issue. I have noticed in android when i do back to back speed test…wifi usually disconnect during the second or third test. 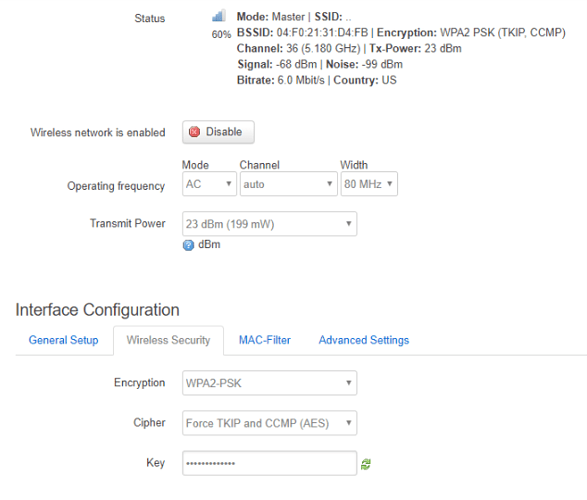 this is my settings… i initially had channel 36 selected and enforce CCMP selected…it didnt make any difference. Check router log when this happens. It’s common problem for more devices you have or just one? This actually works 99% of time. So far wifi dropped only once. thanks.